Slacker Radio for Android updated with station caching | Android Blast! 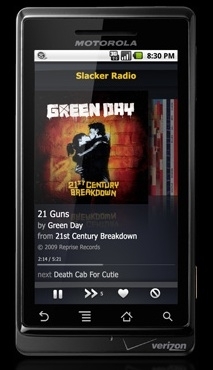 Slacker, Inc. today announced the availability of Slacker Radio 2.0 for Android phones. The update brings station caching to Android phones, meaning Android users can cache their favorite Slacker stations right to their phones to listen anywhere – whether they are connected to a wireless network or not. The application is available immediately by visiting www.Slacker.com from an Android phone or by searching for Slacker in the Android Market. "Android users can now enjoy their music anywhere they go with our personalized and feature-packed Slacker Radio for Android 2.0," said Jonathan Sasse, senior vice president of marketing at Slacker. "The benefits of the new station caching feature enable listeners to travel far beyond Wi-Fi or mobile connections to enjoy a continuous and unrivaled music experience." In order to use the station caching feature you'll need the Radio Plus subscription ($47.88 per year or $4.99 per month). If you'd like to try the station caching for free you can get a 14 day trial period from Slacker.